Arguably one the most rapidly gentrifying areas in New York City, Williamsburg, Brooklyn is home not only to an increasing crop of thirty-something professionals, but also to a burgeoning art scene. These days, the ten-block radius around the Bedford Avenue L-train stop is crawling with small galleries that represent emerging artists, many of them Brooklynites themselves. As a group, these Williamsburg galleries provide a refreshing change from the Soho and Chelsea racket just across the East River in Manhattan. Figureworks, a tiny gallery on the second floor of a cozy townhouse on North 6th Street, is currently showing the latest paintings and collages of Cathrine Westergaard in an exhibition entitled Two Feet Out of the Box. A Williamsburg resident and New York native, Westergaard specializes in small 8” x 8” paintings and collages, with the occasional large-scale exception. Her smaller works, most on square boards, are executed with a rich, glossy oil palette; in several of her larger paintings she leans toward an array of yellows and browns reminiscent of analytical cubist painting. Several paintings incorporate newspaper clippings or stenciled letters, classic Picasso/Braque motifs. Though Picasso references in contemporary art run the risk of seeming cliched, Westergaard puts her cubist leanings to good use. Rather than merely juxtaposing unlikely clippings or elements, Westergaard uses the combination of elements in her collages to comment on both the Cubist fascination with the mechanics of painting and the tradition of postmodern pastiche. 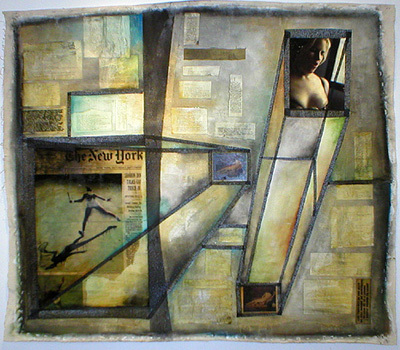 In an untitled 2001 piece, Westergaard assembles an array of materials that include an oversized painting of a New York Times front page, multiple scraps of paper containing journal entries and poems, and strips of black tape arranged to look like orthogonals receding towards a vanishing point. At first glance, the piece seems no more than an art-school found objects collage. Closer examination, however, reveals the underlying harmony of the various elements. The newspaper painting, for instance, bears the loaded date of September, 2001, with the specific day obscured by a strip of tape. The poems and journal pieces which surround this newspaper excerpt exude a sense of impending disturbance consonant with the events not yet reported in Westergaard’s Times clipping. Yet the collage is far more than just a 9/11 piece. Westergaard also uses it as a study of the interplay of realism and illusionism. While she paints the newspaper clipping with meticulous attention to creating the illusion of a real newspaper clipping, other parts of the composition call attention to the very devices Westergaard and other painters use to create such illusions. Her bold orthogonals, for example, proclaim the work’s deliberately illusionistic qualities while simultaneously undermining them. A few blocks south of Figureworks is Schroeder Romero, which is housed in a former factory building on North 3rd Street. Entering Schroeder Romero’s building feels a bit like walking onto the set of a horror movie: visitors pull open an industrial-strength metal door and ascend a dank, cheerless staircase littered with junk mail and empty coffee cups. The gallery itself, thankfully, is well-lit and trash-free. Its most recent exhibition was Robert Boyd’s The Virgin Collection, which closed on December 2nd. 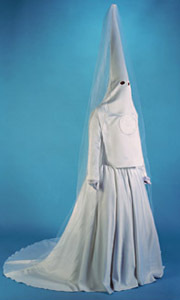 For this multimedia project, conceived and executed in 2001, Boyd designed a bridal gown with a Ku Klux Klan hood as its veil and placed an oversized mannequin bedecked with his macabre “wedding” outfit next to several large color photographs of the same subject. In an alcove at the other end of the gallery, a photograph of a knife hovering in front of a wedding cake was placed behind an actual knife that appeared to have slashed violently into its display pedestal. Adding an extra touch of dark humor to the whole exhibition was The Virgin Collection video which, spoofing the GAP’s “Everyone in Khaki” ads, featured a group of models happily dancing in their grey Virgin Collection t-shirts, the real life version of which were on display near the entrance to the gallery. The overall result of Boyd’s Virgin Collection was an eerie medley of allusions to commercialism, racism, violence, and high art. Bellweather and Parker’s Box, both located on Grand Street, are somewhat more mainstream and established than either Figureworks or Schroeder Romero. Situated prominently on street level, with large glass windows and sleek, Soho-style interiors, these galleries are both in the midst of exhibitions which will run until mid-December. At Bellweather, Sarah Bedford’s Second Nature and Diana Kingsley’s Lovely Swallowed Whole share the gallery space. Bedford, another Brooklyn resident, has drawn inspiration for this collection of her most recent works from her childhood fantasy of living inside a tree. Her mixed-media paintings are startlingly cheerful, depicting dense populations of fairy tale characters who dwell inside the artist’s fantastical trees. Willow ‘o the Wisp (2002) includes an airbrushed Alice in Wonderland, a cartoonish rendering of Pinocchio, and an array of carefully-painted birds and other woodland creatures. Bedford’s use of texture in this piece, as well as in her others, is impressive. She brushes surfaces with glitter, dribbles them with enamel, and even makes occasional use of a cake frosting device to squeeze candy-like patterns of paint onto her canvases. Despite her elementary school approach to surface decoration, Bedford’s compositions never descend into cuteness; instead, their frenetic horror vacuii compositions and flashy palettes lend them a disquieting, dystopic air. Diana Kingsley’s photographs, by contrast, are as simple and uncluttered as Bedford’s are manically busy. The photographs in Lovely Swallowed Whole seek to capture precarious moments, and Kingsley achieves this goal by eliminating from her compositions all but the most essential elements. In Precarious Brood (2001), for example, Kingsley focuses on a nest of eggs perched dangerously on a lightweight pussywillow branch. While the nest is just barely balancing at the moment the picture was taken, one can imagine that a mere breeze might knock its fragile contents to their doom. In similar photographs, Kingsley chooses branches weighted with snow, a wobbling stack of china plates, and an unravelling purple sequin dress as her subjects. Down the road at Parker’s Box, the artists Stephen Bitterolf, Michael Rogers, and Tim Spelios are featured in Drawing Quirks 2, an exhibition dedicated to the place of drawing in an increasingly technological world. 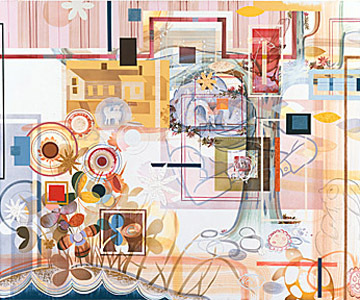 The precursor to this exhibition, Drawing Quirks, was held in May, 2001 and was apparently so successful that the gallery decided to organize a sequel. Luckily, Drawing Quirks 2 does not suffer from sequel syndrome; the 2002 exhibition is in no way dependent on its 2001 counterpart, and the works of all three artists are fresh and interesting. One of the highlights of the show is Bitterolf’s set of charcoal drawings of grass in different New York City parks. Copied from his own close-up photographs of public plant life, the drawings, done just this year, are executed with painstaking detail and coated with glossy vinyl to make them appear even more photorealistic. Even up close, it is nearly impossible to tell that Bitterolf’s drawings are in fact done in charcoal rather than with photo-chemicals. Spelios also toys with the blurry divide between traditional drawing techniques and technologically-enhanced versions thereof. His Stuff I Like (2002) assembles several hundred museum tags on which appear black and white drawings of various items: an owl, a canoe, a basket loom, several diagrams of knots, and so on. Though the impressive level of detail in these drawings suggests that they are hand drawn, the artist reveals that they were in fact printed with an ink-jet printer, and are thus not unique in the sense that hand-done drawings normally are, but instead could plausibly be reproduced by anyone with access to Spelios’s hard drive. Once marginal to the New York art scene, Williamsburg is edging closer and closer to its center. While Soho and Chelsea now tend to favor already established artists, Williamsburg remains a fabulous neighborhood for seeing new art and discovering young artists before they migrate across the East River. Drawing Quirks 2 remains at Parker’s Box until December 16, 2002. The gallery is located at 193 Grand Street, Brooklyn, NY. For more information call (718) 388-2882 or e-mail parkersbox@hotmail.com. Gallery hours are Friday to Monday, 1-7pm. Schroeder Romero is located at 173A North 3rd Street, Brooklyn, NY. Gallery hours are Friday through Monday, 12-6 pm or by appointment. For more information, call (718) 486-8992. Bellwether’s current exhibitions, Lovely Swallowed Whole and Second Nature, run until December 16, 2002. The gallery is located at 335 Grand Street, Brooklyn, NY. For more information, call (718) 387-3701. Gallery hours are Friday through Monday 12-6 pm and by appointment. Figureworks will be showing the work of Cathrine Westergaard until December 15, 2002. The gallery is located at 168 North 6th Street, Brooklyn, NY and is open Friday-Sunday 1-6 pm or by appointment. For more information, call (718) 486-7021. — Laura Wolfram is a freelance writer and teacher in New York City.